Thursday, April 11th @ 3:00 P.M. 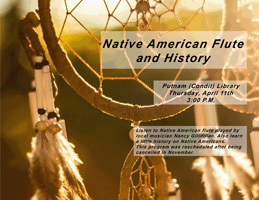 Listen to Native American flute played by local musician Nancy Gillifillan. Also learn a little history on Native Americans. This program was rescheduled after being canceled in November.